A Q Knot is a big rubbery reusable cable organizer that's useful for bundling just about anything. Control cord bundles, organize art supplies, cinch bags sealed or keep loose objects organized. 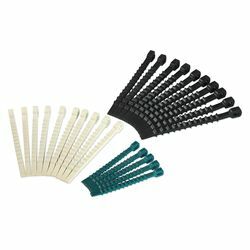 Q Knot Pro reusable cable ties are stronger than twist ties but completely reusable. Q Knot Pro is designed for heavier duty jobs that prefer to tie on tighter and harder to let loose. Q Knot Pro has slanted teeth that are designed for tighter locking!